Friendly and helpful staff. Bus station is infront of the hotel. Booked late for the Ed Sheeran concert and receptionist was very helpful with transport to and from Stadium. We visit family in the area every year. The hotel is close to several family members and allows us to travel rested and well fortified with an excellent breakfast, every time. Thank you. Again. You can not fault the breakfast choices. Coffee was a bit strong for me but that’s just what I like. It was a nice stay with a comfy bed. Just what was needed after a long drive. I asked for a room close to the exit and they gave me. The Internet was free and pretty good. Large, open parking suitable for taller vehicles too. Sehr netter Personal. Möglichkeit eine zweite Decke zu bekommen. Parkmöglichkeit. Sehr bequemes Bett. Alles top in Ordnung! Gutes Preis-/Leistungsverhältnis! Gefallen hat mir das es einen Schreibtisch gab, an dem ich arbeiten konnte. Das Bett war gemütlich und ich könnte darin gut schlafen. Die kostenlosen Parkplätze sind auch gut. ibis Styles Herten This rating is a reflection of how the property compares to the industry standard when it comes to price, facilities and services available. It's based on a self-evaluation by the property. Use this rating to help choose your stay! Quietly located in just a 2-minute walk from the Schloss Park in Herten, this hotel offers a 24-hour reception. Regional specialties are served in the restaurant, which also features a terrace. 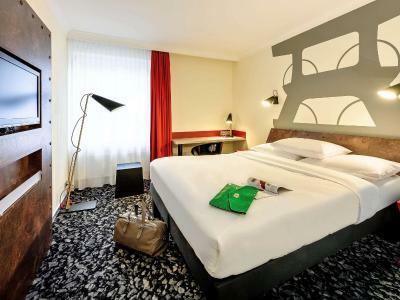 The bright rooms at ibis Styles Herten come with a TV, desk, and a private bathroom. The Veltin’s Arena is a 15-minute drive from ibis Styles Herten, and Movie Park Germany is a 25-minute drive away. Essen Exhibition Center can be reached by car in 35 minutes. Herten Elisabeth Hospital bus stop is located directly outside the hotel, and free parking is available. When would you like to stay at ibis Styles Herten? Featuring free WiFi, a flat-screen TV, a desk and a private bathroom with bathtub and shower. This brand offers stylish, happy and innovative stays to its clients. Each design is unique and is conceived to enhance good mood and happiness. Little extras, great breakfast buffet and free WiFi are also services thought to make you spend a better stay. Let yourself try in one of our 310 hotels located in more than 30 countries. House Rules ibis Styles Herten takes special requests – add in the next step! ibis Styles Herten accepts these cards and reserves the right to temporarily hold an amount prior to arrival. Unfortunately there is no possibility to have dinner. The breakfast - not so many choices and the coffee is very bad. There could be at least one large bath towel in the bath rooms. The concierge switched bills, so I paid for my colleague and vice versa. He also forgot to order the taxi fo rnext morning, that we asked and finally, that the WiFi name differed from the one provided in information material. Anywayit sucked as always in Germany! Room was nice and bed was good - in my opinion! Would have liked a small kettle in room.